"Popup Toolkit gives you the tools you need to create great popups for your site." We have all experienced the annoying popups on websites. We often see these popups on sites that are not very well designed and they, as a result, have left a bad taste in our mouths. We stray far away from sites with popups because they get out of hand, especially on mobile devices. Many popups are under-designed as well and, in some cases, it is hard to find the “x” button or exit from the popup. Popups nowadays are very poorly designed, but they have the potential to be something better; they have the potential to be very useful and the Popup Toolkit aims to make the experience better for both site visitors and developers. Popup Toolkit is an application that allows you to build beautiful, professional popups for your website. You get access to a plethora of options and settings to make great popups that function in the way that you want. You can use the Popup Toolkit to provide your users with pleasant experiences, all the while, getting your advertisements on their screens, increase your subscribers, your commissions, and your profits. 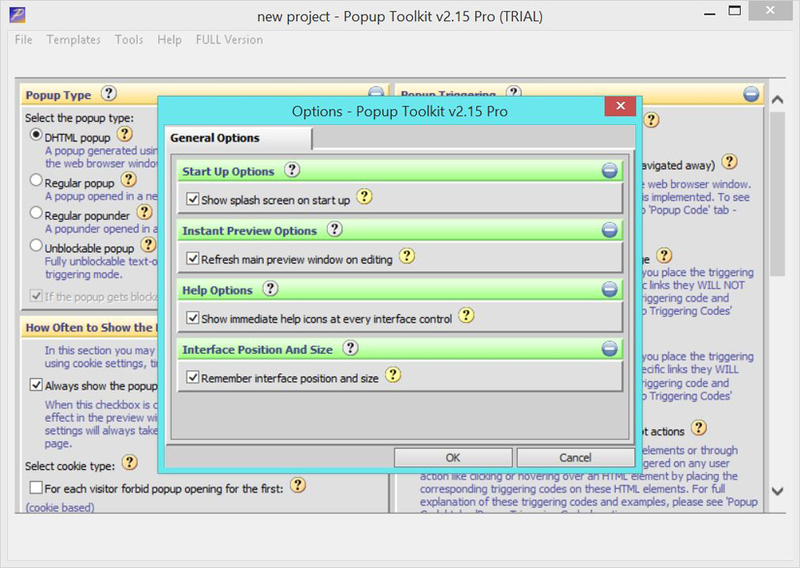 Popup Toolkit gives you several options to create unique popups of various types. You can create an unblockable on-exit DHTML popup. DHTML popups are shown inside of the website. They are great for quick notifications based on user actions or alerts of new content. You can create a regular popup that will open up into a new browser window. While this type has it’s unique uses, it takes your users away from the content on your site. You have the option of creating a popup underneath the browser window; while accessing the popup would require your users to temporarily leave your site, it does not take them away immediately by opening over top of your site’s content and instead allows a user to visit the content when ready. You also have the option of creating a completely unblockable popup. This may be used to prevent users from accessing specific content on your site before they agree to specific conditions or before some sort of authentication. 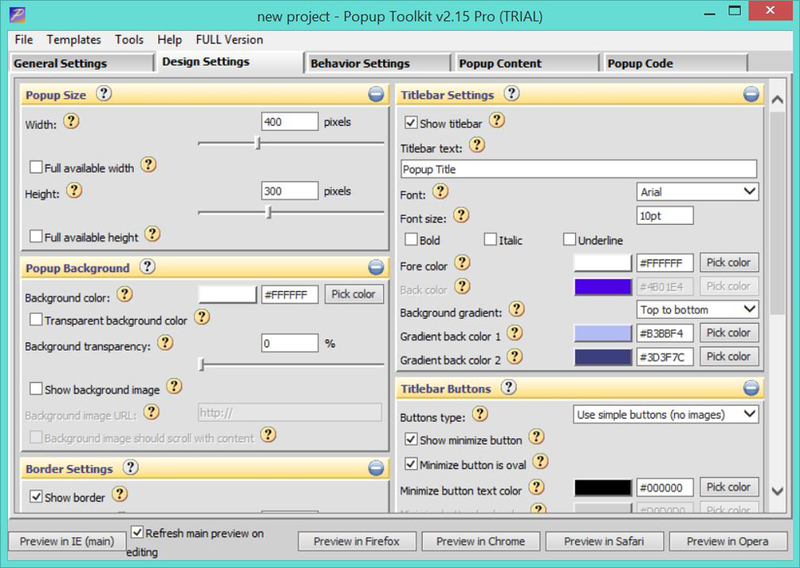 Popup Toolkit’s design settings brings you all of the tools and options that you need to bring great designs to your popup windows. You have sizing and position options such as height, width, set color with or without transparency, buttons, borders, and much much more. The behavior settings allow you to specify and change things like motion and visual effects. You can make your pop up slide, bounce, fade, roll, unfold, jump, give it a caterpillar effect, or just pop up. You can also change the pop up position, time related behavior, modal behavior, and change sliding and other effect settings. 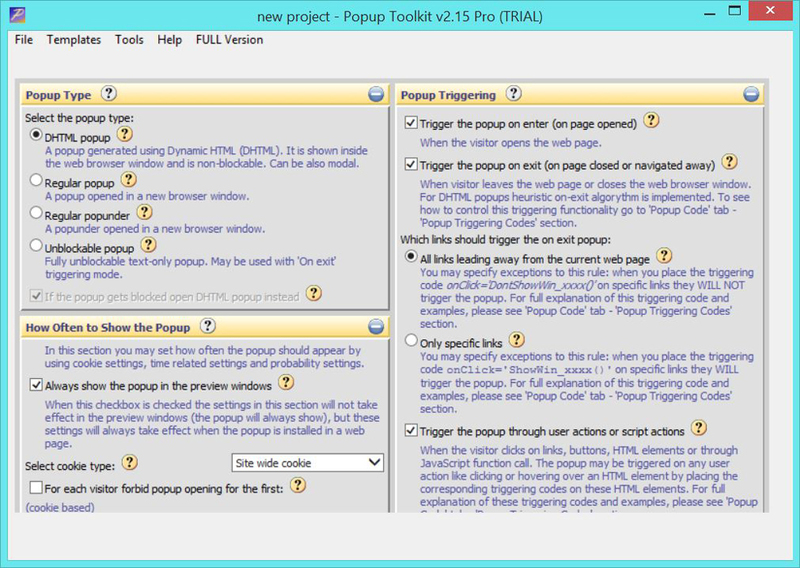 Popup Toolkit also makes it simple to edit the content inside of the popup and edit the code of your pop up so that you can alter any specific part of the popup and make it truly unique and beautiful. Once you think you’ve got a winner on your hands, you can preview the popup in IE, Firefox, Chrome, Safari, and Opera. Of course this is only possible if you have these browsers installed on your system.